For significant dental damage or decay, a simple filling may not be sufficient for rescuing the tooth and saving your smile. In these more advanced cases, a dental crown is often the optimal solution. 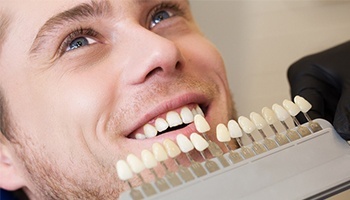 And, thanks to advances in technology, high-quality crowns can now be completed in a single visit to the dentist’s office. Keep reading to learn about how E4D crowns work and how you can have your smile restored in just one visit! The process for a conventional crown usually takes place over the course of two appointments with one to two weeks in between. It is necessary to wear a temporary crown in the meantime -- a one-size-fits-all restoration that may not withstand the forces from chewing and speaking. A same-day crown with E4D technology, by comparison, is completed in just one visit to our office. This can save you sick leave/vacation days from work, and also eliminates the hassle of bothering with a temporary crown that may not last the entire two weeks. In addition to being completed more quickly, the same-day method improves treatment planning for a dental crown. Traditionally, an impression must be made by biting down on a wet hunk of cement for several minutes. But with CAD/CAM technology, a digital scan captures the unique anatomy of the teeth and mouth, allowing your dentist to then create the customized restoration in the same visit -- all in-office. 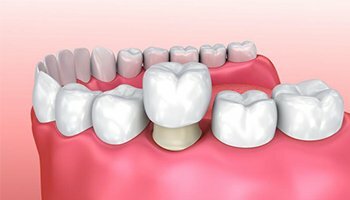 What Is the Process for a Same-Day Crown? To create a dental crown with E4D technology, your dentist will first prepare the affected tooth for the new restoration. This involves removing and reshaping the enamel to make enough room for the crown to be placed on top. Then, a laser scan captures an optical impression of the tooth. Your dentist can then draw a digital blueprint for the crown. This layout is sent to the in-office milling machine, and the crown is created from a single block of porcelain and placed on the tooth in about an hour. Am I Eligible for a Same-Day Crown? Most patients who require a dental crown can benefit from an E4D same-day restoration. However, this may not be the ideal solution for the back teeth, as molars and premolars may require a sturdier material to withstand the forces of chewing. The only way to find out for sure whether this is a viable option for your smile is to schedule an appointment with our office! Do you have a damaged or decayed tooth? Find out how we can help with same-day dentistry! You don’t have to sacrifice vacation days and sick leave to have your smile restored. Go ahead and get in touch with Danville Dental Associatestoday!